Another classic. Not much info on this one either. It's super rare, just like 99% of the Hornby Skewes pedals. Essentially, it's a set booster that you can switch between either bass or treble boost. Rumor has it that it was used by Ritchie Blackmore during the 1960s up until 1974, as well as Jethro Tull on Aqua Lung. Schematic is over at FSB. Awesome. So you found a schematic that had the input and output caps on it. I tried messing with this a couple of years ago the schematic had ???? fr those caps. I never could decide which to use .These are coll and Ritchie Blackmore is one of my favorites. I saw on fsb they were working on his awai tape deck preamp a long time ago trying to make that into a pedal since that replaced this device . Have you ever see n that? I didnt see if they ever finished it .Super cool ! i have not. if you've got a link i'll gladly take a look at it. Something not right here Zach - at least with NPN version - not tried the PNP yet. Is the cut on the top row correct as it's not serving a purpose? I'm getting a decent bass boost on the bass setting, so that part seems right, but the treble boost setting is not quite as bassy but quieter than unity. Definately not a treble boost! hey beaker. i added a link to the schematic over at FSB. the only change i made was that i change the switch to an SPDT. in the schematic it shows a DPDT switch, with pints 4, 5, & 6 all connected, pin 5 going to the output. i'm wondering if the change i made is the issue, so i also added a new layout with a DPDT switch. Ok, moved things around to match the new layout. The bottom leg of the 10k resistor is now not connected to anything. I think it needs to be moved up to row 2 to keep it connected to switch2. Also the switch wiring is not right. I tried it as shown, but got no signal so had a play around and I think I might have cracked it. On the DPDT, remove the vertical link between lugs 4, 5 and 6. Now put a link between lug 1 and lug 6, and another link between lug 3 and lug 4. If you do that it works like a treble booster and it works like a bass booster. I'm still not sure it conforms to the schem though! hmmm. i took a long hard look at this one again before i make corrections and post a revised layout again. hears what i'm thinking, and correct me if i'm wrong obviously. so the switch with the output filter network. we can agree that lug 2 goes to the 100nF off the collector of Q1, and lug 5 goes to the output. the treble section has one connection to lug 1 to connect to the 100nF, and the other needs to connect to the output, so it should be lug 4. the bass section has one connection to the 100nf so lug 3 and he other needs to go to the output, lug 6. this should isolate each output filter when not engaged and make each connect to the 100nF cap and to the output. i think i was trying to make it easier, and actually made it way more difficult. Anybody here has any comments on the difference between the PNP and NPN versions in terms of which trannies to use? Not yet 'cos we can't get it working properly yet! In my opinion I would go with npn Why deal with a battery only or charge pump . I honestly dont think PNP will sound any better if both transistors are of the same quality and hfe. Please correct me if I am wrong. I've got it working as a treble boost OR as a bass boost - can't get the switching right yet. Sounds great with a MP38 with a gain of 72hfe. Zach, I realise I might have confused you with my switch numbering. For some bizzare reason I numbered the lugs like an IC in my post above rather than the usual way. I've only had time to spend half an hour with this today, but no dice with the switching so far. haha, i knew something was messing with my head. it's all good. i posted the layout with the switch like i tried to describe. maybe *fingers crossed* i got it right this time. You can tag this Zach - the updated switching arrangement works perfectly. The bass boost setting is noticeably louder than the treble boost, so some adjustment of the resistor values might sort that out. The treble boost has a bit of grit to it, even with low power pickups. It has an odd "hollow" character to it. I like it, but others might disagree. I'm using completely the wrong guitar and amp for Blackmore comparisons, but I can see how this would would work if you want to get his tone. Just for the record, just about any transistor and any hfe works in this - does not seem to affect the sound that much, just the volume and amount of grit. It's definately NOT a Rangemaster - it has a completely different vibe to it. Mark posted the JHS Treble Booster a few years ago - that layout has the Blackmore mod on it, so it would be really easy for you to add it to this. Apparently RB used the Selectatone, but on the treble setting only, and had a pot wired into it for variable volume. I guess that mod would only affect the treble boost side of the circuit though and not the bass side? I've done the original PNP layout and sounds phenomenal. I use only the treble side with a OC75 (95hf) and a master volume at the end without de last 100K resistor. I thing that a input cap switch it's a good idea, also, a presence pot before the master can works well. Well, I've built the PNP with a voltage inverter and works fine. I have used a OC75 with 95 hFE and around 400uA leakage, I thing that the transistor should have a medium leakage. I have modified the input capacitor with a blend pot (150K C) 1n/100n for a filter but the stock value (100n) has more gain. Thank you zosotone. I have changed my board to the npn version and now it works as a bass and treble booster. I made the NPN version of the pedal yesterday. The bass boost works perfectly but if i switch to the trebleside, de volume drops and i don't really get a trebleboost. 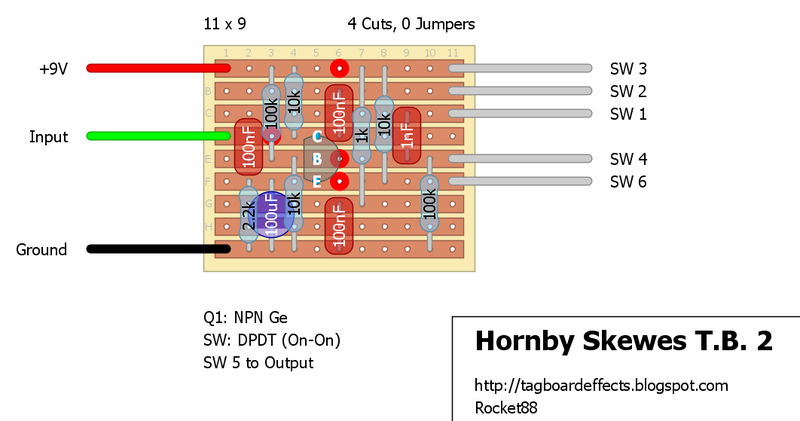 I just followed the NPN schematic from above.